Long Island College Hospital at 339 Hicks St., in Cobble Hill. COBBLE HILL — After spending months in and out of court, staving off SUNY Downstate from shuttering Long Island College Hospital, advocates are looking to raise funds to battle mounting legal fees. “There’s no question that if we hadn’t engaged legal council, it would have been closed,” said Dr. Toomas Sorra, president of Concerned Physicians of LICH. To raise money, LICH supporters are hosting the first “Atlantic Frantic Fundraiser” on June 14 at 320 Atlantic Ave., from 6 p.m. to 9 p.m. at $50 per person. “We’re frantically trying to save LICH,” said Sorra. The fundraiser, organized by the Concerned Physicians of LICH, will include food and wine from local Brooklyn businesses like the Heights Chateau and the Cobble Hill Health Center, he said. 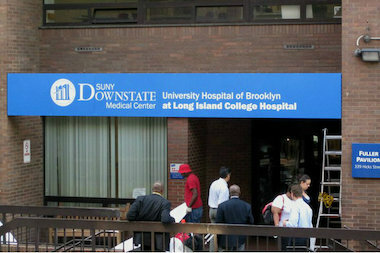 While SUNY Downstate withdrew their plan to close the hospital in April, their new “sustainability plan” doesn’t guarantee the hospital’s survival either, according to reports. SUNY officials say they are in negotiation with potential operators for the hospital, but Sorra is preparing to continue their fight to keep the hospital running, he said. Pietro Costa, who owns the Atlantic Avenue space, said he has rushed LICH on several occasions because his son is highly lactose intolerant. Travelling to a hospital that was further away could have created a “life or death” situation for his son, said Costa, who is a real estate agent in Cobble Hill. Through the fundraiser, Costa hopes to strengthen grassroots efforts to save the hospital. “We’ve had a long relationship with LICH,” he said. For more information on the fundraiser, visit this website.